[162 Pages Report] The data center asset management market is expected to grow from USD 731.5 Million in 2015 to USD 2.81 Billion by 2020, at a Compound Annual Growth Rate (CAGR) of 30.8% from 2015 to 2020. 2013 has been considered as the historical year and 2014 as the base year for performing the market estimation and forecasting. The exponential growth in the amount of data consumed by various industries, individuals, and organizations has resulted in a swift increase in the demand for data storage. The growing data and storage requirement increases the associated data center assets and costs. In order to minimize the cost associated with the operations of data centers and to maximize profits, various organizations developing more scalable and efficient data center management solutions. In the present scenario, the global data centers are undergoing through technological transformations and are experiencing significant adoption and they are also expected to experience an exponential growth in the coming years. The global data center asset management market is segmented into various application types across geographical regions such as North America, Europe, APAC, MEA, and Latin America. The market has also been segmented into diverse industry verticals which include BFSI, IT and telecom, government and public sector, healthcare, energy, and other verticals. Top-down and bottom-up approaches were used to estimate and validate the size of the global data center asset management market and to estimate the size of various other dependent submarkets in the overall market. The research methodology used to estimate the market size includes the following details: Key players in the market were identified through secondary research and their market shares in respective regions were determined through primary and secondary research. This entire procedure includes the study of the annual and financial reports of the top market players and extensive interviews for key insights from industry leaders, such as CEOs, VPs, directors, and marketing executives. All percentage shares, splits, and breakdowns were determined by using secondary sources and verified through primary sources. All possible parameters that affect the markets covered in this research study have been accounted for, viewed in extensive detail, verified through primary research, and analyzed to get the final quantitative and qualitative data. This data is consolidated and added with detailed inputs and analysis from MarketsandMarkets and presented in this report. The data center asset management ecosystem comprises of data center asset management vendors such as Schneider Electric, HP, Emerson Network Power, IBM, Raritan, CA Technologies, Fieldview Solutions, BMC Software, INC., and Huawei among various others. A few small and medium-sized companies such as Modius, Inc., AssetPoint, Inc., DCIM Solutions, AlphaPoint Technologies, and others provide comparatively narrower, yet locally effective solution portfolio and distribution networks in the data center asset management ecosystem. These vendors provide innovative asset management solutions and services to end users in various industrial verticals, including IT and telecom, BFSI, government and public, healthcare, energy, manufacturing, media and entertainment, and others. During the forecast period, the data center asset management market also presents a potential opportunity for various data center hardware, infrastructure vendors, and operators in the data center industry. The data center asset management market report is broadly segmented into following components, data center types, services, deployment types, verticals, and regions. The report covers all the major aspects of the data center asset management market and provides an in-depth analysis across the regions of North America, Europe, APAC, MEA, and Latin America. 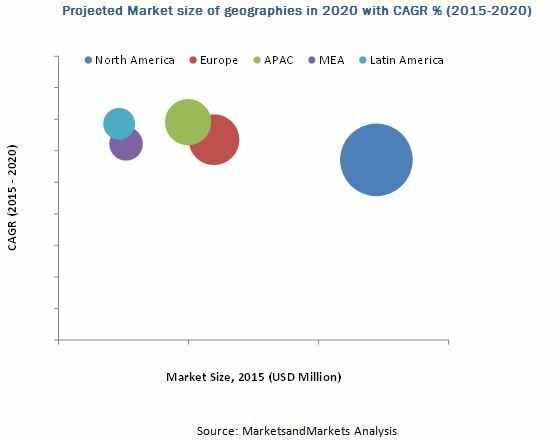 North America is expected to hold the largest market share, whereas the APAC region is projected to have great opportunities in this market, growing at the highest percentage of CAGR by 2020, due to the developing infrastructure and increasing number of data centers in this region. Though the users are quite reluctant towards changing the existing traditional data center management practices, the time and cost-saving benefits of data center asset management solutions support the adoption rate, which is expected to increase in the next five years. Few of the major vendors providing data center asset management solutions and services are HP, IBM, Schneider Electric SE, Emerson Network Power, Nlyte Software, Optimum Path, Inc., Raritan, CA Technologies, FieldView Solutions, Inc., Huawei Technologies Co. Ltd., and others. These players are adopting various strategies such as new product developments, partnerships, and business expansions to cater to the needs of the market.